Which Soldering Iron to Buy? So the question is, should I browse ebay and look to buy an older Weller model even if it's used? Is there another brand of soldering iron that is currently the best to buy and will offer me the best quality? I don't mind spending $50-$100 on a high quality soldering station that will last. I want something in the 60W range that performs well. Variable temperature doesn't really matter to me. The main use of this will be for small projects like wiring arcades, fixing old video game consoles, small electronic projects (nothing too heavy duty). Re: Which Soldering Iron to Buy? I have an Aoyue 968A+ and love it. 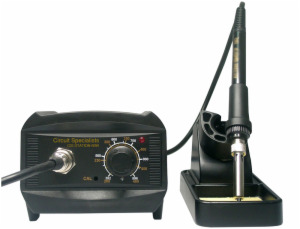 I have 60W soldering station from circuit specialists and can't fault it at all. Has been very reliable and used for all kinds of soldering tasks - including soldering up hundreds of KADE devices. My model seems to be discontinued now but there are various alternative models including similar one with digital temperature control. I purchased with various tips but have mostly used the conical/fine point tip for precision soldering - with 0.5mm 60/40 solder. Also recommend these for cleaning the tip: http://www.circuitspecialists.com/ty-98.html as they keep the temperature stable compared to the wet sponges. degenatrons, this station looks looks similar to the one you posted and looks like it has everything I need. It looks stable and the reviews looks good. Now this Hakko is a good step up, and would only spend the extra $50 if the quality is really that much better than the one above. I'm interesting in this topic as well, been thinking to upgrade from my $35 ones. Just a general question, what are we looking at for heatup times on nicer stations? Wow, that is quite a soldering station. How well does that smoke absorber work? Very well. It gets 95+% of the smoke during heavy soldering sessions. Love that feature. It comes up to temp in about 30 seconds. And it's nice having the hot air blower too. I hate soldering. After struggling with a few different electric irons (admittedly, all elcheapos), I bought a Weller Portosal. I still hate soldering, but less. & I use sal ammoniac to clean the tips (as I always say, if u go this route, get a filter mask or other ventilation solution--the fumes off that stuff r nasty). I bought that Hakko this summer and will never use anything else. I just used it this weekend to repair a Centipede to JAMMA adapter as well as solder some wires to an audio potentiometer. Pull the trigger on that sucker. I'm very happy with the "bang for buck" of the Aoyue. Mine doesn't have the smoke absorber but it's still a nice digital station. Comes up to temp in no time. I haven't had mine long enough to speak on the longevity of it but it doesn't feel cheap at all. I love my Weller WESD51. The digital display is handy. The warmup time is short. The tip has not worn one bit. I've had it for almost 4 years. I bought that Hakko FX888D awhile back to replace the various cheap irons/stations I had used previously. I've put it through its paces building several thru-hole circuits as well as repairing a friend's LCD TV. Haven't used it for SMT work yet, but it has done everything I've needed with zero problems. I don't think you'd be disappointed if you bought it. I wholeheartedly recommend it. Thanks so much for the feedback. I think I am going to go with Hakko FX888D since it seems to be a solid station for most people. I'm going to wait it out a few days, do a little bit more digging for reviews, and let it sink in that I am going to get this (so I avoid that impulse buy feeling and know that I really want to get this). Thanks for all the help, I really really appreciate it! Thanks so much for the feedback. I think I am going to go with Hakko FX888D since it seems to be a solid station for most people. I actually took mine into work today (along with my 808 desoldering gun) to change the caps on an LCD TV. Super handy and portable! You mean to tell me that this isn't a good Soldering Iron ...? Placed my order for the Hakko FX888D last night. Super excited! I have the older brother of the Hakko 888, (the 938) that I use at work. I've knocked it off the bench a few times and it still works. no problem with bumping up the temp to heat up some extra big pads with huge thermal mass. heats up quick. The 888 looks to be new a streamlined version of the 938, same iron different station. I love the 938 so I may have to pick one up to use at home. I picked one of these up a month or two ago, and I've been very happy with it. It's 45w not 60w, but it performs very well. You can find this, spare tips, and a spare iron for around $100 give or take. 'Tis what I use. Have done hundreds of controller hacks and numerous other jobs with that tool. I've had it for probably 8 years now. Thats what I am currently using. If Haruman can solder with it, I guess I can't blame the hardware for my sloppy soldering anymore. If you're going to do a lot and do anything with a heavy gauge wire, a good iron will make your life incredibly easier. Just like everything, invest in a good tool and it will last forever and work great. All the recommendations for a Hakko are spot on. We use one in the store and I personally own a FX-888 at home. They are incredible, they heat up almost immediately, the cords are nearly tangle free. Very nice. However, given what we do here on BYOAC it's probably overkill for most things. 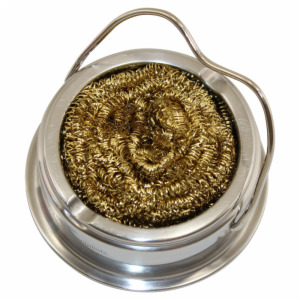 If you are on a budget, for about half the cost of a Hakko... I would easily recommend this Weller Unit. It's adjustable up to 40 watts, which is plenty for anything Arcade related the adjustable "heat" is very helpful, the iron just plugs into the powersupply, so if an iron goes on you down the road it's easy to replace and the whole unit works well as a stand/etc. I used one of these for years. And Weller tips are really easy to find.